A mother, a daughter, a wife, a full-time finance professional and last but not the least a food blogger, I have no option but to juggle between the roles. I must mention I love to do that. There are people, my family and especially the little lady and even colleagues, and friends who encourage and support me to cope with all. While clicking the pictures at around 6.45 a.m. yesterday, I was planning for the entire day! The day after the photography followed with office, visiting the remote field, then attending a bloggers meet and finally ended with coming home to pasta, helping her with the dinner and a quality time spent with the husbandman. This is nothing new to me and this is how I want my life to be, a productive one. However, coming to the early morning photography, I actually was clicking my working lunch, the Watermelon, Black Olive and Feta Cheese Salad that I was carrying to the office. This is something l love as part of the lunch. Whenever I feel like having something tasty yet light and full of the dose of energy. I mostly carry Salad in case I have to attend a blogger’s meet or any event it the latter part of the day where I suppose to eat a lot. I am a proud plus size but I try to keep the energy level right. l love something tasty yet energetic and easy to carry as part of the lunch, and salad is exactly the same. I mostly carry Salad in case I have to attend a blogger’s meet or any event it the latter part of the day where I suppose to eat a lot. I am a proud plus size but I try to keep the energy level right. 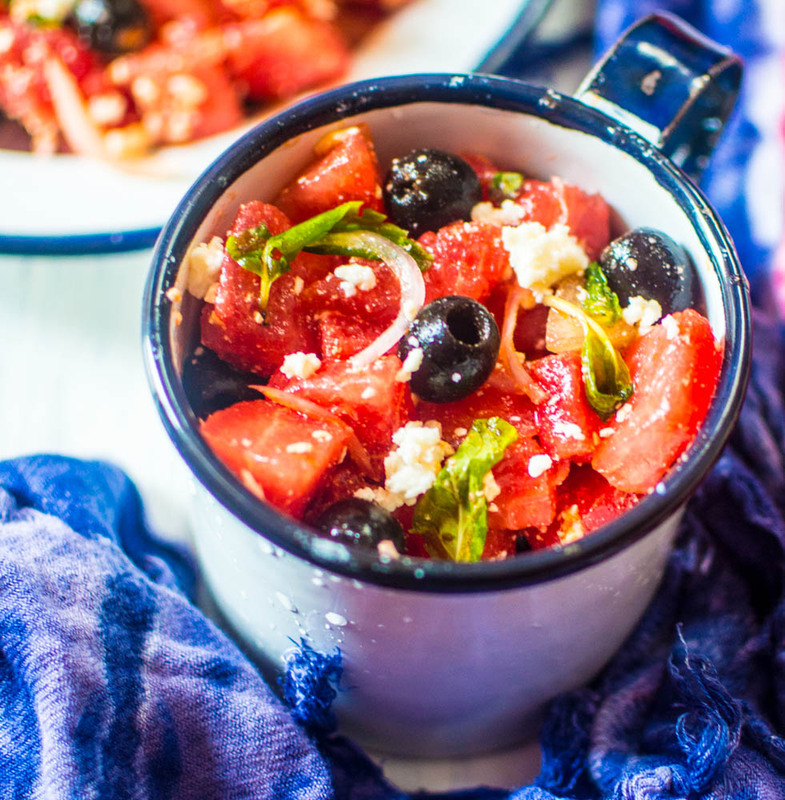 This post was not planned and is something I make quite often but when I saw the bowl filled with the Watermelon, Black Olive and Feta Cheese Salad I made, I thought to click the same and decided to post. I guess this will help many who are typically like me and even not. 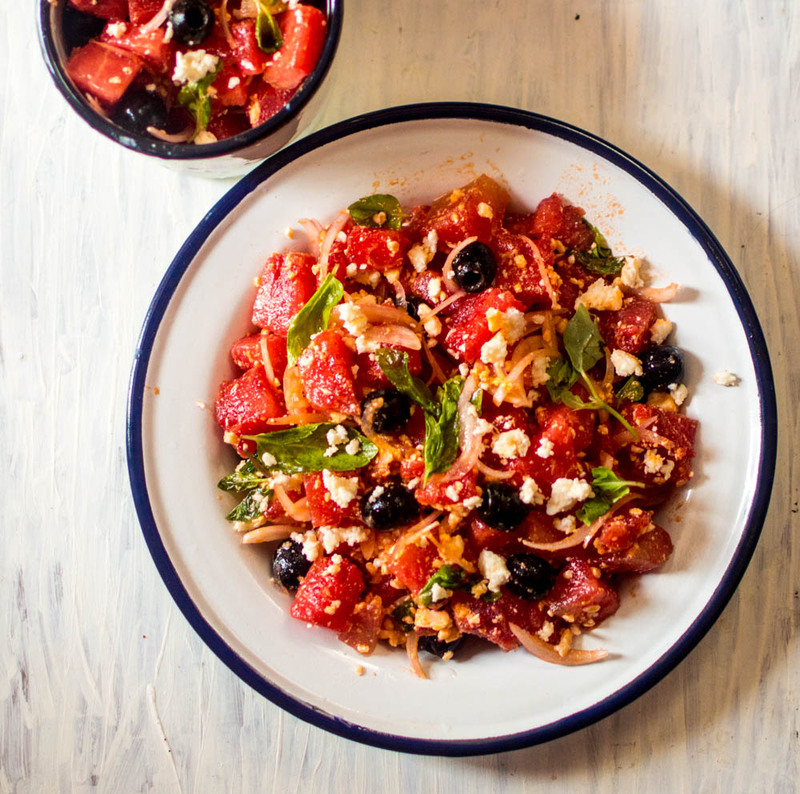 This Watermelon, Black Olive, and Feta Cheese Salad indeed is tempting and anybody can try. 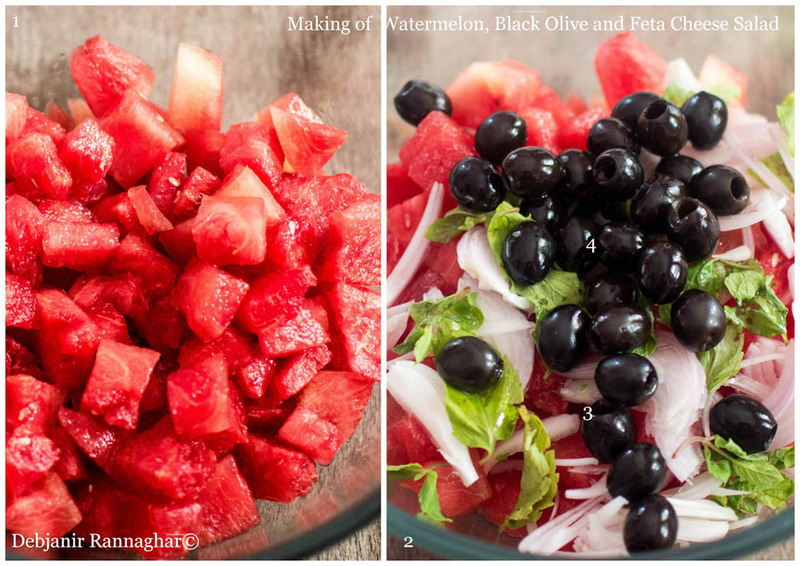 The Watermelon, Black Olive, and Feta Cheese Salad is a summer delight for me. It is refreshing, tremendously tasty, very easy to make, handy and last but not the least colorful with the right dose of fructose and milk content with the punch of olives. Many people use Blackberries in the Watermelon, Black Olive, and Feta Cheese Salad. However, I don’t like extra sweetness but prefer a tanginess. I prefer to add a lot of lemon juice and finely chopped onion along with Watermelon, Black Olives and Crumbled Feta Cheese. By the way, it hardly takes 15 minutes to make the salad. Cut Watermelon into cubes, and if not seedless, remove seeds. Finely chop the Onion and toss with ½ Tsp. of Lemon Juice with the Onion. 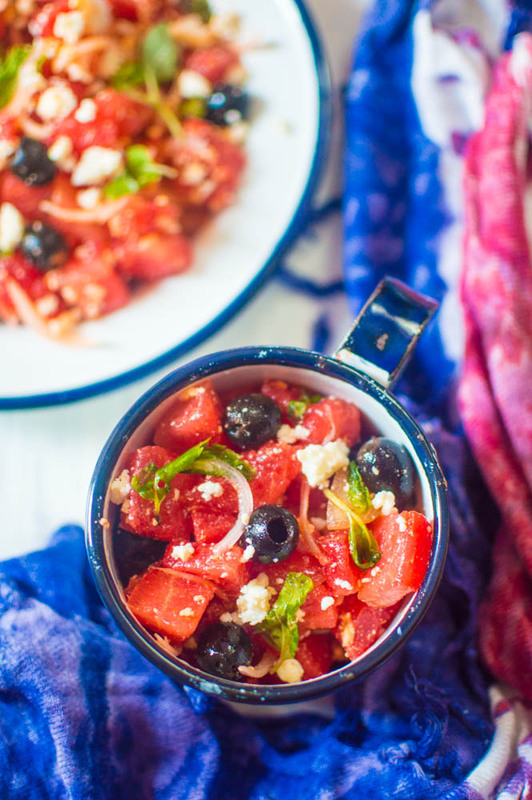 Now take a bowl and mix Watermelon, Chopped Onion, Black Olives, Mint Leaves, and Lemon Juice using a spatula and lastly add crumbled feta cheese and fridge the salad before serving. « Bohri Dawat by ITC Sonar, Kolkata!